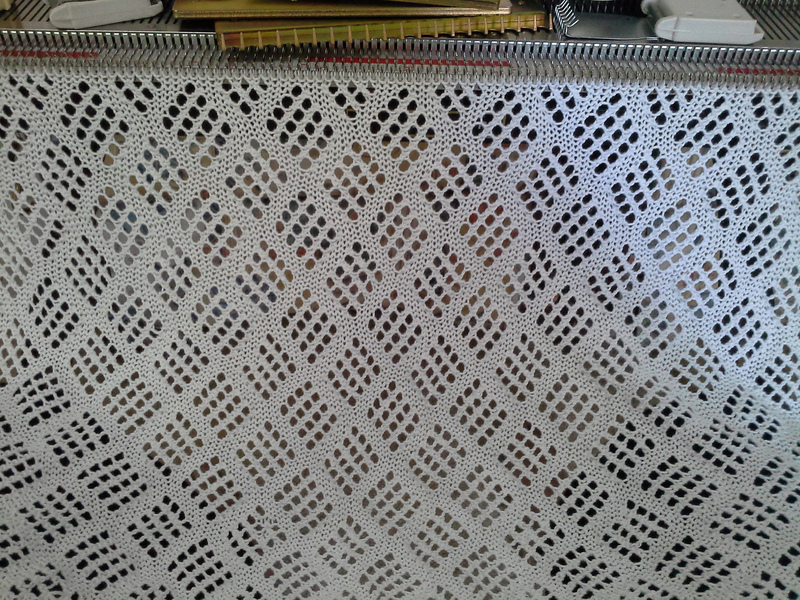 I'm writing a bit about knitting lace with cotton so I thought I might as well blog it too. I use commercial 4ply cotton, mostly from Bendigo Woollen Mills and other sources as well. I was surprised to learn “it was hard”. Noone told me that before I started. A good thing I think. I’ll start with the obvious. Cotton has no give, not a lot of memory and doesn’t want to bend or perhaps loop well within the needles. The more transfers in the row with a lot of stitches in work means problems with transfers. There’s a little bit of difference between the KH lace makers and the SK’s LC 1 or 2. The brother lace carriage transfers all the stitches with the lace carriage and then two rows are knitted with the main carriage and will do fine lace. Whereas the SK’s LC is a separate complete carriage and either knit and transfers in the same row (called simple lace) or with the flipping of a lever and removal of yarn, works the same as the KH’s method – transfers all then flip the lever back, yarn back in and knit two rows. This is fully fashioned lace. 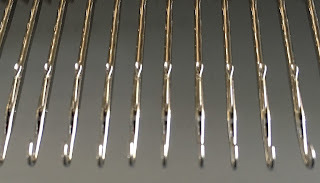 I prefer to use the LC2 lace carriage (on my SK280) simple lace for cotton lace work. I think this method best suits cotton. I’ve found the more transfers in the same row, the more opportunity for the stitches at the beginning of the row to jump off needles. 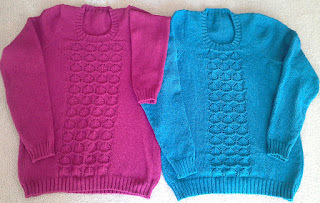 The fully fashioned method has more opportunity to slip off the needles after the stitches are transferred multiple times before being knitted off. Although some people say the angle of the ribber clamps works better, I didn't note any difference between having the main bed flat or on an angle. 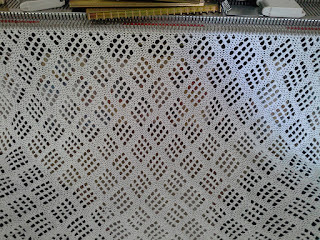 Next is the logistics of getting your cotton lace project made with as few dropped stitches as possible. First thing is to make sure you have a really good sponge/retainer bar. A must. Next is to bring out all the needles that are planned to be used. I hope you can see from the photo. If a needle has a bent shaft or tip. the stitches will not transfer correctly and drop. It’s far easier to replace them. It really is. 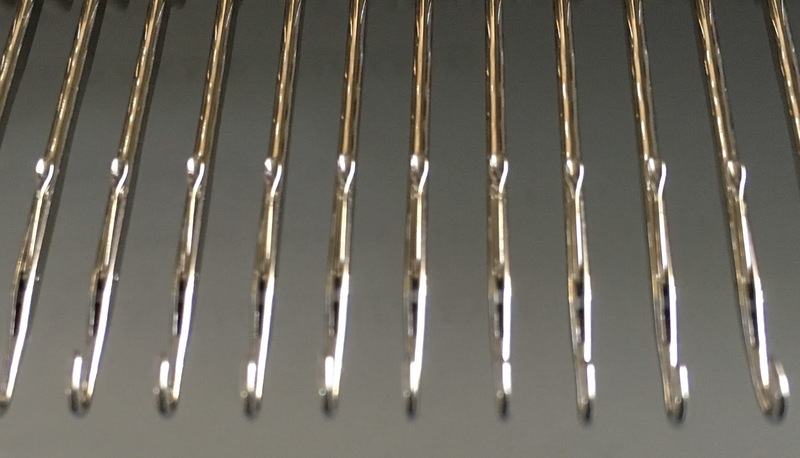 If you pinch them together you will see – one way will transfer, but the next time you ask it to transfer the opposite direction, no luck, stitch drops. Next on the list is weights. I know, I know some people don’t use them. Well they probably don’t knit cotton lace either, because for lace, we need them. Lovely even weight evenly across all stitches to ensure they transfer correctly, knit off and stay put. And the yarn. It must not have ANY KNOTS, breaks in the yarn HAVE to be on the sides, I’m sorry, but knots create havoc. 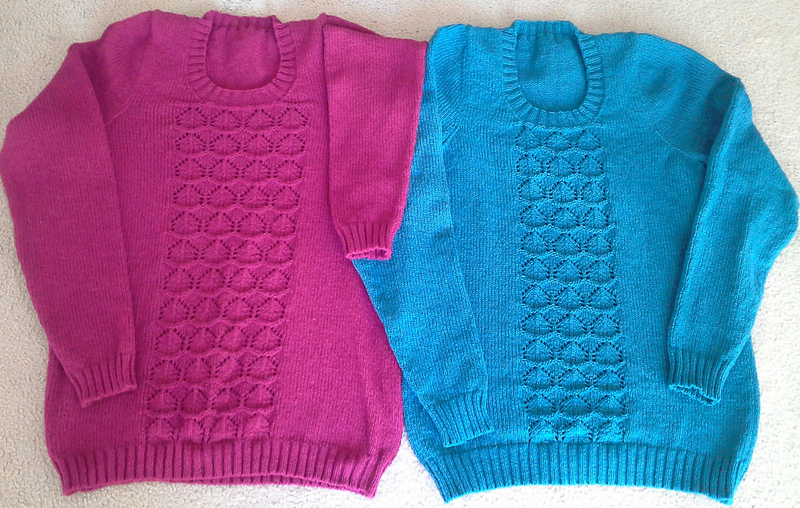 On that long row – a lot of transfers in the same row on a wide piece, I always run my thumb along the needle butts. I can feel the transfers that have not gone to plan as the needle doesn’t go back all the way to same place as its neighbour, the stitch hasn’t formed correctly, so I flip the yarn off the needle, check the transfer, fix if need be, and reknit. If I don’t, this one will drop next row, whether it is knitted or not. It never hurts to have really good light and check the row has knitted correctly. I usually do this at the same time I’m running my thumb across the needle butts. It adds a little bit of time to the project, but the bonus is no dropped stitches, no jammed carriages. After a couple of repeats of the pattern it becomes pretty clear where the transferring is a big ask in cotton. And the less dropped stitches the quicker the work is off the machine and on to the next project. I’ve done hand transfers on 8ply cotton blend, excellent, but again, nice even, firm weights are essential to keeping the stitches on the needles. And it only took me an afternoon to do the front panels, pretty quick really.